Wachusett is the most popular ski area in Massachusetts.“Wachusett” is the Algonquin Indian word for “The Great Hill,” so don’t expect big mountain skiing – but do expect a well run family oriented ski area that cranks out the ski lessons and cranks their lifts till 10pm at night. Just 60 minutes from Boston, Wachusett is easy to reach, and open day and night. Wachusett is best known as a family learn to ski mountain, with twice a day grooming, and a top ski and snowboard school, over 200 instructors teach thousands of lessons day and night, after school and on weekends. This family ski resort is all about making it easy for parents – from its easy access and affordable family ski tickets, to an immense base lodge with one level convenience, plus Skybox suite rentals upstairs. Wachusett has serious snowmaking too, doubling their snow blowing capabilities in recent years to cover 100% of all 108 acres. Wachusett has excellent kids ski and snowboard lessons and camps, starting with all-inclusive Polar Kids programs for first time skiers age four. 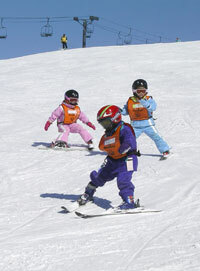 For kids learning to ski race, Wachusett’s seasonal “Dev” team for ages six and up meets all season long. For kids whose parents don’t own condos up North, the race and freestyle programs tech local kids to compete as early as age eight. 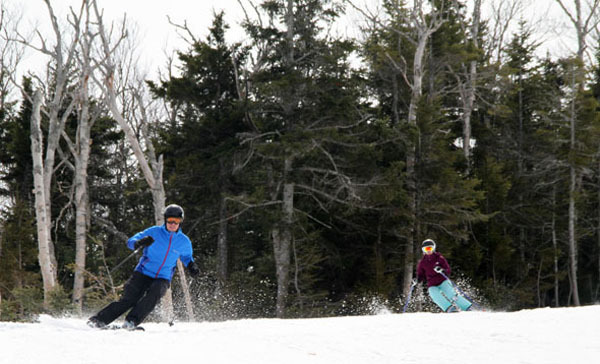 Wachusett even plans ski and snowboard day camps over school vacation weeks. Wachusett is the #1 NASTAR resort in New England and in the top 10 ski resort in the country for ski racing. High schools and colleges host after school race training competitions here all winter. Wachusett’s terrain park now has a Big Air Bag and a Revolutionary War Cannon to jib. Wachusett’s history dates back to the 1930’s when the CCC cut trails here, the first Pine Trail in 1934 and the Balance Rock Trail in 1937 – which is now Wachusett’s longest ski trail at 1.5 miles. Wachusett receives many Green Awards for their environmental efforts and is actually located in an Old Growth Forest. Wachusett’s expansive base lodge, built in 2001, offers every family ski service imaginable, plus après ski lounges and entertainment on weekends and night skiing evenings. Upstairs Wachusett’s lodge offers Mountain Suites, like Gillette Stadium’s Box Suites, you can have your own private SkyBox on the slopes with concierge, food and beverage service and a view of the skiing. Wachusett also has an outdoor patio with fire pit for socializing and après ski with a view of the slopes too. Though its half the size of other Top New England Family Ski Resorts, with 1,000’ vertical drop and three high-speed quads, Wachusett provides a big mountain feel with day trip convenience and cost. Wachusett is a hub for NASTAR racing, the #1 race course in New England, and the top 10 in the US for amateur racing. There is no on mountain lodging at Wachusett, the first hotel was constructed on the summit in 1882, and a second hotel was constructed in 1907 but was destroyed by fire in 1970. You can stay a few miles away at the Wachusett Village Inn which is operated by the resort owners, the Crowley family. The Crowley’s sister company to Wachusett is Polar Beverages – since 1882, proudly served in the base lodge. Wachusett has an MBTA Ski Train from Boston, the ski area will credit your train pass toward the purchase of a lift ticket. Call it the 8-hour ski vacation. 100% snowmaking with ample water supply from Wachusett Lake.